Market leading technology with componentry that you’d expect to find on a much more expensive e-bike. 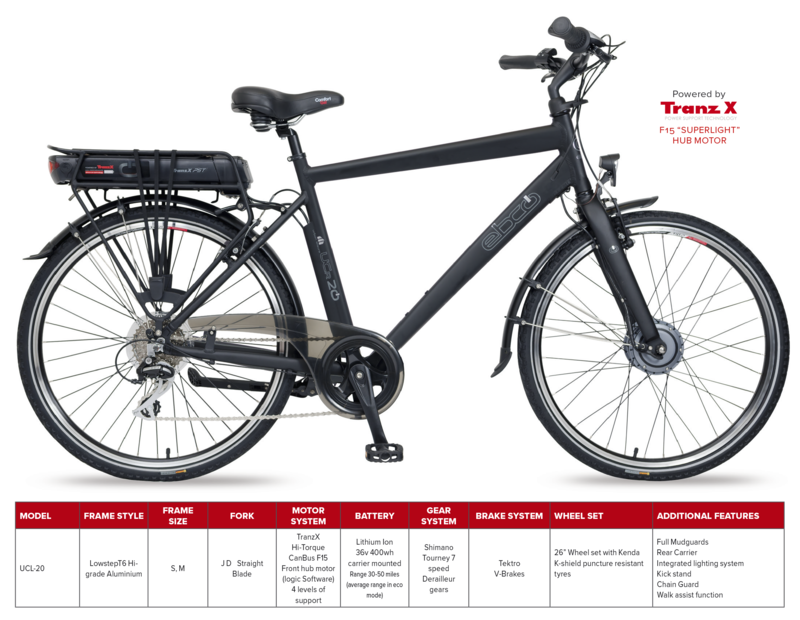 Our bestselling e-bike features the new TranzX F15 front drive motor delivering a hi-torque quieter performance and now incorporating CanBus/ Logix computer diagnostic capability which gives more efficient and accurate information for your EBCO service dealer and together with a larger 400wh battery will give more miles (range 30-50 miles) of enjoyable e-cycling add to this our new headstock comfort front suspension unit and you have a quality fully equipped e-bike that offers tremendous value for money for both the commuter and leisure cyclist. Our original UCL/R-30 won The Sunday Times ‘In Gear’ best buy award and was selected to feature on BBC’s the One Show electric bike feature. Available in a traditional Roadster frame style with a comfortable upright riding position. Sizes :- M.L. Finished in Matt Gunmetal.